The following are Conference Venues SA’s top five conference venues in Muldersdrift. Heia Safari Ranch is a three star game lodge, hotel and conference centre, nestled below the Swartkop Mountain Range next to the Cradle of Humankind only thirty minutes away from Pretoria and Johannesburg. The lovely Lodge is situated on a game farm that is set in the tranquil indigenous South African Bushveld. The charming Hotel complex and Conference Centre consists of thatched stone buildings that are surrounded by beautifully landscaped lawns. Enjoy free wi-fi throughout the complex and ample secure parking. The Heia Safari Ranch restaurant is a beautiful venue for exceptional dining with windows that overlook the swimming pool and Lake Heritage. The zebras use the swimming pool as their watering hole to the delight of the restaurant guests. Lake Heritage, which is contained by one the largest hand built stone dams in South Africa, is a fantastic place for bird watching, fishing, canoeing open water and swimming. The conference centre consist of 3 air-conditioned conference rooms of various sizes for up to 100 delegates and 4 syndicates rooms for up to 10 delegates. The centre is self contained with cloakrooms, telephone facilities – that can be connected to the Internet. In the main building, additional meeting rooms are available. The hotel grounds are ideal for team building. After a hard day of conferencing enjoy a game drive at the Rhino and Lion Park. For a pleasant night’s sleep enjoy the comfort of one of the 50 two bed-roomed thatched bungalows; all with en-suite bathroom and a lovely verandah. The bungalows are fitted with Satellite T.V., M-NET, radio, telephone and a coffee/tea machine. Enjoy a sundowner whilst watching zebras and the family of giraffes which wander around the hotel area. Spending a weekend is the perfect escape from the tension and the concrete jungles of Pretoria and Johannesburg. Silverstar Casino’s stylish conferencing facilities accommodates up to 500 delegates, the conferencing venue has a large ballroom that can be divided as well as three private break-away rooms. Silverstar in Muldersdrift offers guests a five-star catering experience whether it is for a banquet, cocktail or conference style event. The on-site audio-visual experts use the latest technological equipment to ensure that the event is professional and hassle free. Silverstar Casino is the premier entertainment destination on the West Rand’s first casino. Silverstar offers excellent entertainment and the pick of performing artists live to ensure you have the time of your life. The Silverstar experience comes complete with a variety of restaurants and fast food outlets. Restaurants include; Steak, Ciao Baby, Black Cherry and Centre Star Buffet Restaurant. Southern Sun Silverstar is a 34 roomed modern hotel that offers luxurious accommodation and a magnificent view of the lake and boardwalk. It sits alongside some of Gauteng’s best tourists destinations. The Cradle of Mankind, Maropeng, The Sterkfontein and the Wonder Caves, The Rhino Lion Park, Lion Park as well as the Krugersdorp Game Reserves, Bunge Jumping, Canopy Tours and is situated only 15 minutes from Lanseria. Other nearby activities include Ingwenya Glass, Gilroy’s Brewery, Hot Air Ballooning, Fly Fishing, as well as 2 golf courses in a 10 km radius. The 4-star Misty Hills Country Hotel, Located in the relaxing and luxuriant Muldersdrift countryside with exclusive Conference Centre & Spa offers an ideal location for both locals & visitors to South Africa. The hotel is located in tranquil beautiful gardens with top quality services and amenities delivered with a distinctive personal touch. Capture the essence of Africa only 45 minutes from Pretoria or Johannesburg. This charming and lashing venue is situated in beautiful landscaped gardens, exhibits an abundance of indigenous birdlife and plants. Ideally positioned with easy access to major airports and metropolitan centres in the Gauteng district, Misty Hills has made its name as the perfect retreat for conference delegates and guests seeking relaxation, tranquility and personal, friendly service. Facilities at Misty Hills Country Hotel, Conference Centre & Spa : Health Spa, Tennis Court, Outdoor Chess, Volleyball, 2 Swimming Pools. In keeping with local market demand, Misty Hills offers combined conference and exhibition facilities. Part of recent comprehensive hotel renovations, the original workshop has been converted and recycled into a modern atmospheric exhibition centre, ideally suited for small to medium sized events. The 1000 square meter air-conditioned exhibition centre will comfortably accommodate 55 exhibitor. The stand layout is flexible in design to suit individual requirements and is suitable for a variety of décor options including carpet, Hessian, rattan and wood flooring. A catering service is also available. 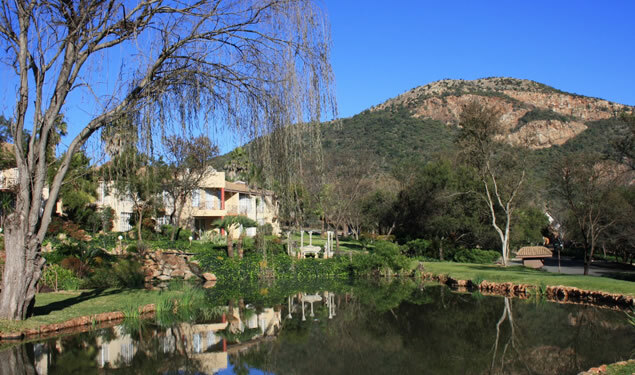 KoelenRust Estate nestles in a lush garden amongst large trees in the quiet valley of Muldersdrift in the West Rand. The tranquility and peace will take you far from the city lights. Yet, it is only 30 minutes drive from Johannesburg, Pretoria or Sandton and 10 minutes from Lanseria International Airport. This is your ideal breakaway in the country, be it pleasure or business. A conference at KoelenRust provides a distinctive country experience. The meeting room is situated in the garden and offers complete privacy because of the exclusive use of the entire lodge during the company’s stay. The lodge is suitable for adults who want to relax in a calm and peaceful location on weekends. Rediscover the art of doing nothing – whether you go for a walk to enjoy nature, enjoy a real bushveld braai in the boma, relax next to the pool, cuddle up with a book. KoelenRust Estate is the place to relax. For the more adventurous, KoelenRust is the perfect place to use as your home base for outings to the tourist attractions in the area, The Crocodile Ramble, well known for its variety of fascinating places to visit. Included among these are The Cradle of Humankind with the Maropeng Centre, Sterkfontein Caves, the Lion and Rhino Nature Reserve, Wonder Cave, Heia Safari Ranch with its exciting Sunday afternoon traditional dancing spectacular, and the Crocodile Ramble’s growing range arts and craft shops and art galleries,. The natural setting of the conference room – in the garden amongst towering, shady trees – inspires creativity and is therefore ideal for mini conferences, workshops, training, informal meetings, corporate incentives, director breakaways and retreats. This unique venue offers complete privacy in a country style set-up for smaller groups, away from the office.. The meeting room is situated in the garden which will ensure complete privacy and seclusion from the outside world. An entirely different environment to a conference room in a city hotel. The Lodge is also ideal for small informal functions such as corporate breakaways, birthday garden parties or intimate garden weddings for people who prefer a country atmosphere in natural surroundings. Country Park Conference Venue in Muldersdrift is the ideal stopover for international tourists from southern Africa and overseas. The venue provides a relaxing atmosphere in the heart of a busy African city and is ideal for travellers stopping over in Gauteng for business, weddings and conferences. It is also ideal for overland tourists, self drive tourists, overnight travellers, motor homes, over landers, backpackers, group gatherings and caravan clubs. In the Cradle of Humankind, and nestled at the foothills of the Zwartkops Mountains, Kloofzicht Lodge is the essence of ultimate luxury and tranquility, a comfortable 40 minute drive from both Pretoria and Johannesburg. Guests entering the magnificent Kloofzicht Lodge are greeted with the stunning view of endless stretches of water as the infinity pool spills over into the Kloofzicht dam, and settling into the Zwartkops mountains in the distance. Kloofzicht comprises 20 executive suites, 18 deluxe superior suites, 10 superior suites and 12 double suites, overlooking either the pristine Zwartkops mountain and gorge or the six beautiful fly fishing dams. Five star wedding and conference facilities meet the needs of even the most discerning guests. The small but glorious nature reserve upon which the lodge is built, is home to kudu, red hartebeest, impala, springbok, gemsbok, blue wildebeest, eland, zebra as well as a fascinating array of bird life. Kloofzicht Lodge is the perfect venue for upmarket conferences, product launches or special functions. The eight meeting rooms, complete with state of the art conference facilities, seat between 10 – 120 delegates. Allow the highly skilled and trained staff take care of all the details to ensure a hassle free event, from décor to catering. A wonderful option to enjoy the African outdoors is the boma, perfect for memorable occasions and team building. Authentic African meals are served. The venue includes basic equipment (overhead projectors, screens, whiteboards and flipcharts). Additional equipment is available, and rates are supplied on request. A variety of different teambuilding areas available. SolRidge is an exclusive Conference Centre, Function Venue and Guest House conveniently situated just off the Krugersdorp/Pretoria Highway and Hendrik Potgieter intersection in Muldersdrift with ample secure parking. Solridge is set in beautiful surroundings and allows one to totally get away from the maddening noises of the city and get focused with no distractions. Riverstone Lodge is a unique and spacious hotel in Muldersdrift with a warm ambiance and situated in landscaped gardens with the Crocodile River running through it. This countryside hotel offers 50-luxury rooms, including 37 Luxury Twin/Family Rooms. There are 12 Executive Suites with King Beds and private balconies overlooking the river, and one Superior Suite with King Size Bed and a private plunge pool in its own garden. Savannah Room – An informal venue ideal for birthday celebrations & business functions accommodating up to 100 guests. The venue leads out onto lush lawns and the Crocodile river. Hakunamatata which means “No Problem” is situated in Muldersdrift, 40 minutes from Pretoria and 30 minutes from Sandton. Set in rolling lawns with water features where indigenous birds abound, filled with magnificent old trees and fragrant flowers, the ultimate in exclusivity at a country estate with a difference. The décor is ultra-modern with an African elegance and boasts unique cultural paintings and artefacts. At night, the light of burning torches and the tranquillity of the Highveld landscape enhances this most beautiful African rural setting.